I have a relatively small garden at the back and at the front of my property. The front is rectangular with flower beds surrounding all sides. The rear has patio around three sides and a flower bed along the fourth. I have a raised pond with a brick wall one corner of the rear lawn and a large silver birch tree in another corner. Both are flat. A simple , but long, video giving an overview of the design and operating menus. Unlike most challengers, the boundary wire in my garden was installed by hand and not the big cable burying machine. As a result, the wire is sitting on to top of the lawn and I was told that it would sink in to the lawn after a few weeks. Move forward three months after installation and the boundary wire had still not sunk in to the lawn as promised. 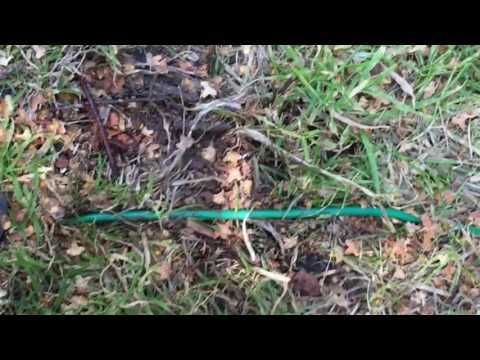 In this video I show how the wire is still exposed and a quick demonstration of how I manually went about burying the wire in to the ground and how it looks after (although I seem to have lost the video I made showing the rest of the garden afterwards). It seems quite the tradition to stick a Go-Pro to an automower and record the action. So, not to be left out, here's my own video (Go-Pro borrowed from a friend's son). 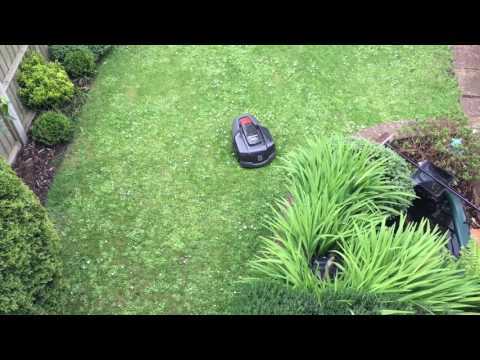 This video shows just how exhausting cutting the grass is with an Automower. In this video I test the Automwer alarm on a freshly depleted battery, one that's been dead for just over 24 hours and, finally, what happens with the alarm if the power switch is manually turned off. 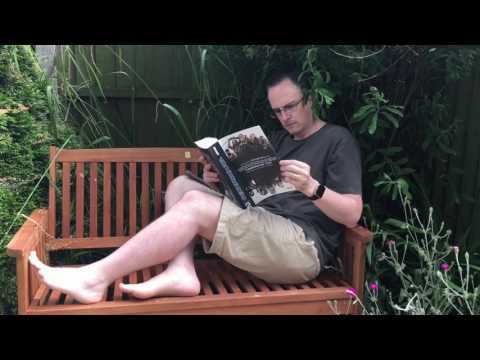 This video shows just how I went about proving that it is possible to install a secondary area with no apparent link between the two gardens. I was disappointed to be left with only half an installation to start with, but was pleased to be able to find a solution that works perfectly. 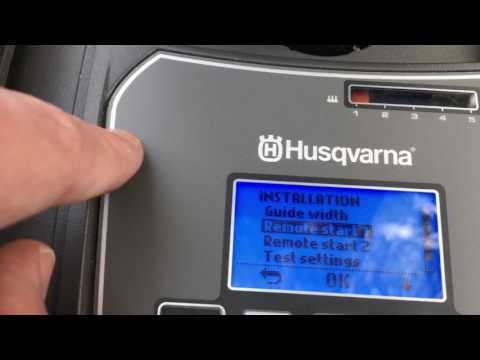 I have invited Husqvarna and the installer back to see how I solved the problem in order that they can use my example to assist with other future installations with a similar garden set up to mine. So far I'm really pleased with the results of my little Automower 105. Before installation, I wasn't really sure just how evenly or neatly the Automower would actually cut. I'd seen the videos online of course, but those all seemed too good to be true. I just couldn't see how the random pattern of the mower would actually result in full coverage and a close and tidy cut. It has certainly been a relief to see the results so far have been a cut just as good as I was getting from my old hover mower, but with none of the effort. 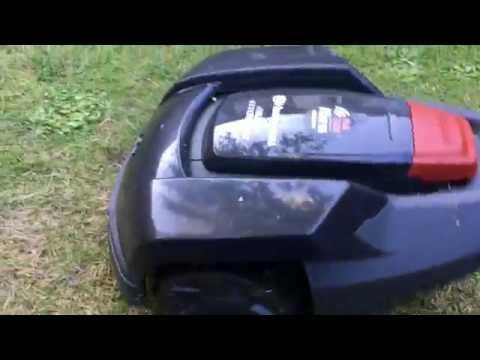 The current quality of my lawn isn't that good, but that's got nothing to do with the Automower. I need to overcome the amount of daisies I have. Plus, the weather has been pretty dry and cold lately so the lawn is looking a bit brown and patchy (nothing a bit of rain won't fix). The amount of attention the Automower is getting has been impressive. I get asked about it from friends and family and the neighbours all stop to watch it in action. I was a little disappointed to be receiving the 105 model after seeing everyone else receiving much more advance models. But I only have a very small garden, for which the 105 is perfectly suited (almost, but more on that in a minute). I have to say, the 105 fits in very nicely and moves around my garden much more nimbly than the larger models would do. After a few initial set up issues and familiarising myself with the set up menus, I've discovered that all the smart features I craved to test are really not needed for my garden as once all st up it really is just a case of letting the Automower get on with the job as programmed. There may be a few tweaks needed, lowering the cutting height and adjusting the mowing time and days, but after that I think the 105 will be left to its own devices and the cutting of my lawn will be totally autonomous process. The installation didn't go quite as I'd hoped. Both the Husqvara rep and my local installer were very friendly and we all got on really well. 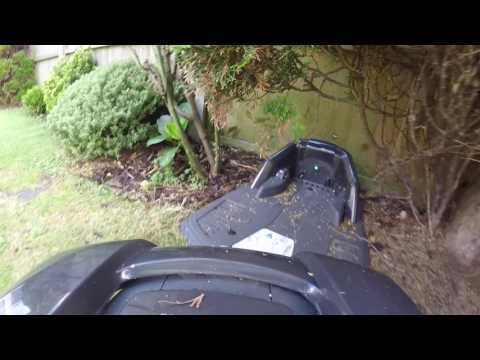 However, I have a front and back garden that I need the Automower to work in and was told there is nothing that can be done to have the Automower working in the front garden as I live in a terrace house with no link to the front and back gardens (I have since come up with a solution I hope will work, but will be quite imaginative. 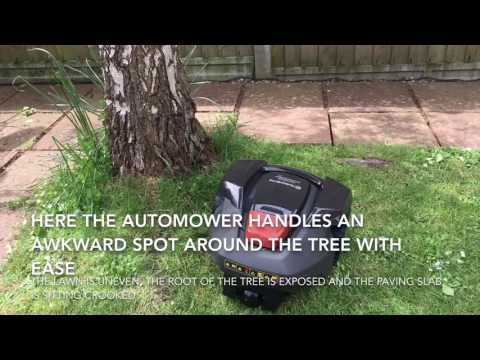 I'll post another video on that as I really want to be able to show the Automower 105 will work for anyone with the exact same garden set up as me, which is a very high percentage of the population for those unable to afford a large detached property). The other part of the installation that wasn't how I wanted it is that I wanted the cable buried as I have children using the garden, but that would not be accommodated. Both the Husqvarna rep and the local dealer are adamant that the cable will disappear in to the lawn in a week or two. I'm quite sceptical about this, but will trust their experience (this will be another video I will post at a later date). Lastly, I was left with a non functioning Automower to start with. The set up was completed on the Friday, with the first mowing sequence due on Saturday morning starting at 10am. 10am came and went, but the Automower remained in its docking station. After a little head scratching and reading the instructions, I managed to work out that the Home button had not been pressed and Auto was not selected. Once this was done, the Automower was all set and started its mowing cycle. I could be annoyed by this having been missed as part of the set up process, however, it gave me the chance to really become familiar with the set up menus rather than having it set up fully for me and not looking at the menus for quite some time. I very quickly became familiar with all the set up options and really feel I know the mower settings inside and out (they are really simple and logical to follow on the 105). 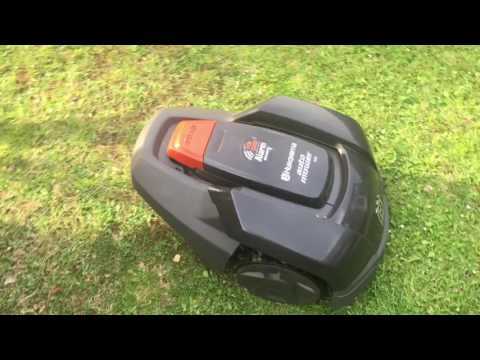 As of yet, I can't comment on the mowing quality as I have the Automower set to its highest setting waiting for the cable to disappear in to the ground. The grass doesn't seem to be getting any longer at least. Although everyone else comments on how quite the Automower is, for me and my neighbours it is not quiet enough to have it running at night. The reason for this is that we are very close terraced houses and right on top of each others gardens, the sound from each garden travels straight up to the neighbouring bedrooms. For a larger detached property, this would not be an issue. The mower is of course much quieter than a standard mowers, so daytime noise from lawn mowing is completely eliminated. We've named our 105 Mo, which is short for Mowey McMowface (topical). I can't wait to get it fully set up in the front garden so it can really become part of my gardening maintenance.